The purpose of this book is to add a new concern to the list of issues contending for position on the nation's urban policy agenda. 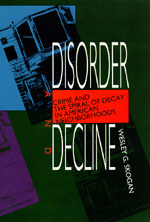 By highlighting the relationship between disorder and neighborhood life, Disorder and Decline attempts to expand the scope of the traditionally popular "crime" agenda to encompass other pressing features of urban life. To do this, it was necessary to demonstrate that issus like vandalism and public drinking are somehow as "important" as burglary and drug abuse; thus the book's focus on the serious consequences of disorder for community stability. Because many disorder problems clearly are unresponsive to traditional criminal justice solutions, the book also called for thinking more expansively about what can be done to counter community decline, in particular by the police. Wesley Skogan is Professor of Political Science and Urban Affairs at Northwestern University and directs the Program in Law and the Social Sciences.